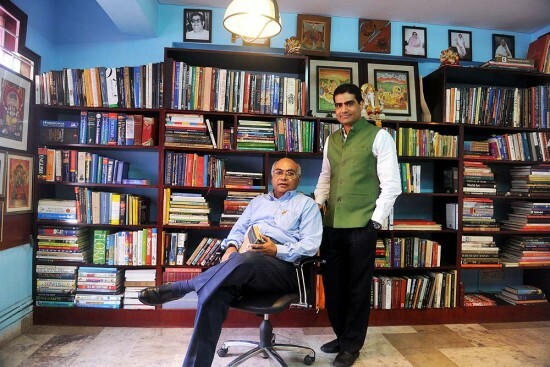 Rupa's chairman R.K. Mehra on the big changes and challenges in the publishing industry. In a letter Jawaharlal Nehru writes to daughter Indira from Naini jail in the early 1930s, he says “a firm in Calcutta—Rupa & Co—with a branch in Allahabad, has sent me books from time to time. They have good books as a rule and English publications”. It will be 80 years this month since Rupa & Co set up shop to become India’s largest homegrown, fully family-owned independent publishing house today. Rupa’s chairman R.K. Mehra reinvented the firm by sig­ning on authors like Chetan Bhagat, and now his son Kapish Mehra, managing director, is rising up to the challenge to face larger global giants. Excerpts from an interview to Stuti Agarwal. What are the big changes publi­shing’s seen in the last 80 years? R.K. Mehra: Rupa’s journey, starting in 1936, has been fascinating. It’s a great feeling to be a local publishing house that dominates in a non-local language. Over the years, business strategies have changed but the core of publishing—to assess what the reader wants and give them that in good quality—can never change. The reader’s needs, and categories within publications, may change, so you have to keep pace. There’s always something new. The publishing industry worldwide is not on a sound financial footing, but we have survived for 80 years. We were born a year after Penguin, and that company was our inspiration. In these 80 years, Penguin has been sold three times, while we stand independent. Do you intend to keep it that way, family-owned and homegrown? Kapish Mehra: We are homegrown, yes, but we are already global. You can get a Rupa book anywhere in the world, within 48 hours of ordering it. We also have e-books. I think the next big thing is not about technology, but content. How a person consumes it is not our prerogative. Earlier, our goal was to expand geographically, now it is to make the delivery efficient. Content and distribution are the two pivots we are working on. But in today’s tough market, would it not make more sense to have an international backer? RKM: We are very proud to be Indian and have not looked for opportunities. We had a 60:40 partnership with Har­perCollins when we got them to India. We became a powerful company, but even in our partnership days, we did not stop publishing under our banner. We parted ways after nine years when we realised we didn’t have much to gain. And ind­ependence is an excellent thing to have for any business. Rupa books are known for their affordable prices. How does it work when there are such deep discounts online? KM: Rupa has its own distribution system. This enables us to reach bookstores across the map, small and big, in sufficient quantities and quickly. This helps us sell better and gives us economies of scale, enabling us to get better retail costs. As for discounts, yes, there is a gap, but it is not huge; any retailer, online and offline, gives an average of 10-20 per cent off. Is it feasible to publish only Indian authors? KM: The consumption of Indian authors in English literature has significantly increased in the last few years. Of course, international bestsellers will sell, but if you com­pare the Indian portfolio to the Western one, there isn’t much of a gap in sales. It’s important for us to focus on quality content and not think of publishing only Indian authors as an impediment. What is your formula for finding the next bestselling author, another Chetan Bhagat? RKM: Originality of idea, continuity of thought and a clear target market. Yes, Chetan Bhagat is one of the bestselling authors, but there are many such under Rupa’s banner. And what is important for us is not just big names; we ensure we take on everyone we think must be read. We don’t sell authors, authors sell us! Of course, we facilitate media interviews and book signing and other interactions, but that’s not much. Also, social media has a big role in book promotion. Many family-run businesses have seen rifts, how has Rupa avoided it? KM: As a family, we have one vision for our business. Our perspectives may differ but oneness of vision keeps us on track.